BAA initiates neighborhood emergency preparedness outreach with volunteer Team Captains: Can you sustain yourself and family for two weeks after a catastrophic event? Do you know how to turn off your utilities as water, gas and electricity if required? Do you have a Grab and Go bag prepared? On Wednesday, Mark Goodman MD, Chairperson of the Emergency Preparedness Committee, conducted a meeting with Bel-Air Emergency Preparedness Team Captains and Co-Captains at the BAA office. Team Captains were given radios, literature, N95 masks and addresses of their neighbors in their sectors. The Team Captains will be knocking on doors in their sectors to directly outreach to residents that will include a survey, educational resources in order to encourage all Bel-Air’s residents to be self-prepared when an overwhelming disaster or a catastrophic event strikes that overwhelms our emergency responder resources. Each household should be prepared to sustain itself for at least two weeks. This emergency preparedness outreach is an adaptation of the Resilient LA program and the LA Emergency Management Department’s Ready Your LA Neighborhood (RYLAN). If you would like to participate in our community’s Emergency Preparedness team — or if you have any questions —please contact the Bel-Air Association office by calling (310) 474-3527 or email info@belairassociation.org. 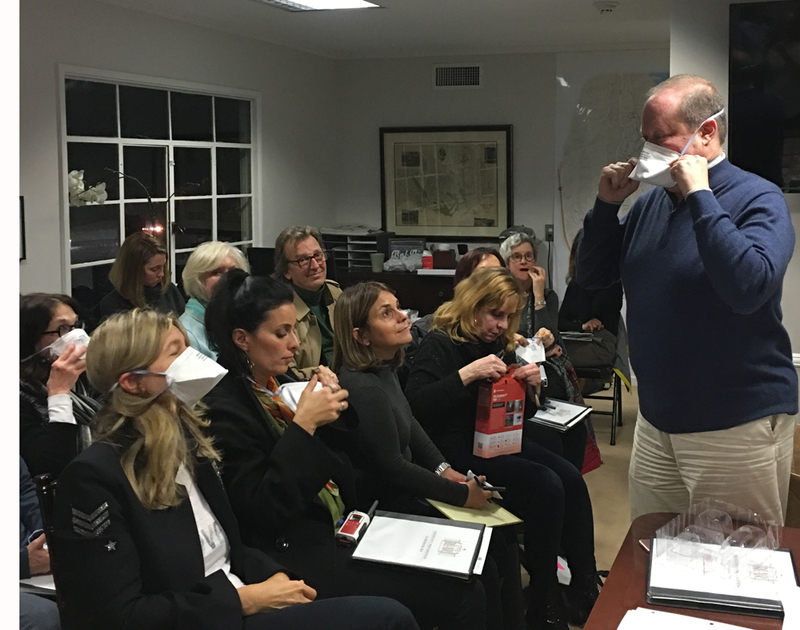 Dr. Goodman shows Neighborhood Team Captains how to properly don a N95 mask.